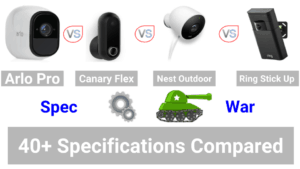 Are you looking for an outdoor security camera that is battery operated and wireless? These cameras are the most convenient and flexible cameras available on the market. Without having to worry about a wire to power the camera or a wire to connect it to the Internet, the only constraint that you have on the position of the camera is the strength of your Wi-Fi. How do These Security Cameras Work? Can Outdoor Security Cameras Be Used Indoors? How Are Outdoor Security Cameras Powered? Which is Better, Wireless or Wired? Where Should I Place an Outdoor Security Camera? Outdoor Security Cameras and Lighting, How do I Set it Up? 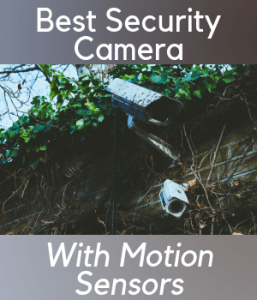 Are Outdoor Security Cameras Worth It? The chart below looks at the power options for all of these cameras in much more detail. All of these cameras can be powered by batteries alone. Most battery operated security cameras have built in lithium ion batteries, but some like the Wansview camera in my comparison use 18650 batteries that you need to buy separately. The Blink XT uses standard or rechargeable AA batteries. Built in lithium ion batteries can either be recharged by plugging a power lead into the camera for a few hours (without detaching the battery) or the batteries can be detached and then plugged into a power supply. To many people, a detachable battery is the most convenient because it means users don’t have the hassle of connecting an outdoor camera to a power source. But, in order for this system to be perfect, you will need a spare battery to use in the camera whilst the original is being charged. They can also all be powered by a power cable, which comes with every camera. But here’s the thing. All of the power cables are only rated for indoor use and not outdoor use. And so, for those of you who are going to place your camera outside, you should not leave the power cable permanently connected. One of the latest developments in charging technology is the use of solar panels with outdoor gadgets. In my comparison, the Arlo Pro, Reolink Argus 2 and the Ring Spotlight can all be powered via a solar panel. But these solar panels need to be purchased separately and you should only buy a solar panel that has been made by the same company that makes your security camera. You do use use your camera too frequently. There is enough space near to the camera to mount the panel. Now let’s take a look at another important feature of these security cameras, which is their wireless connections. Looking at the chart below, we can see that there are two ways in which these cameras connect- base station or directly to a WiFi router. 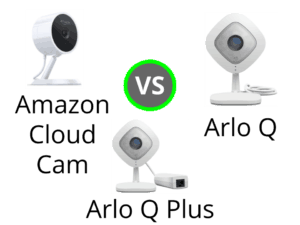 The Arlo Pro, Wansview and Blink XT cameras all use a base station to connect to WiFi. Base station act as a bridge between a security camera and a WiFi network. The base station connects to WiFi and the cameras connect (wirelessly) to the base station. The chart shows how many cameras can connect to each base station. 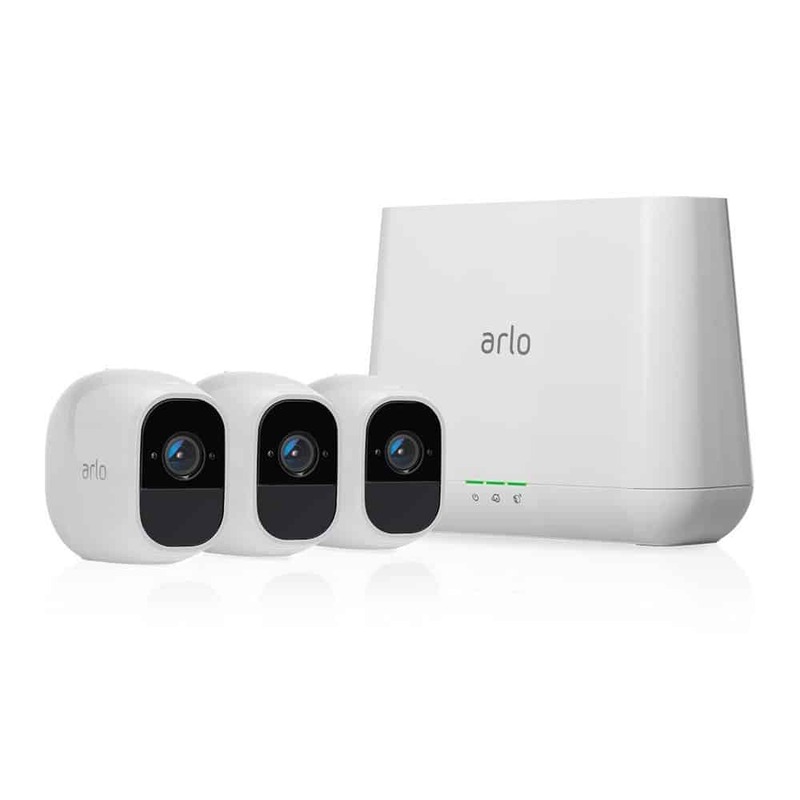 An Arlo Pro base station can have up to 15 cameras connected to it, the Wansview can have up to 4 and the Blink XT can have up to 10 cameras connecting to the base station. All of the base stations in this comparison are powered by a power cable. However, whilst the Blink XT and Wansview base stations connect wirelessly to your WiFi router, the Arlo base station uses an Ethernet cable. In contrast, the Reolink and Ring cameras do not need a base station and they connect directly to your WiFi router at a speed 2.4 GHz and not 5 GHz. You are looking for a camera to use outside and therefore your camera needs to be tougher and more “bulletproof” than a camera that you might buy for indoor use. Fortunately, for us there is an industry standard rating for any electrical products that are designed to be used outside. The IP rating is a scale containing two numbers, ranging from 0 to 9. The first number measures resistance to dust, the second measures resistance to water. The higher the number the greater the resistance. The chart below displays how “outdoor proof” each camera is. All the cameras in my comparison, with one exception, have an IP rating of 65, which as far as protection goes, is pretty good. If you want a little more protection, then you might want to look at this well liked wireless outdoor security camera. It has an IP rating of 66, but it isn’t battery powered. Outdoor cameras come with features that improve their outdoor performance. However, this does not limit their use to only outdoors. Their weather proof casing and out door mounts make it great for outdoor placement, but these can be used in doors with added benefits too. However, solar panels that are used to power many outdoor systems will not work in low light. This means that you will either have to recharge the batteries of the cameras or wire them up for indoor use. Most outdoor cameras are either wired or wireless. In this day and age, the industry leans towards wireless, but either design can still be found online. Wired refers to power wires coming from an outdoor (or indoor) powerpoint to power the camera. Many outdoor camera now use solar power to recharge the batteries. This is efficient, environmentally green and effective for small camera systems. Many outdoor security camera packages will even provide their own solar panels which can be easily installed to your roof. Using just a little sun they will run your camera for days. This is a hotly debated topic, either system has advantages and disadvantages. But really, it is decided by what you need the system to be used for. For a large business or complex, a wireless system could be overwhelmed by the number of cameras. Most wireless system and routers can only support 4 or 6 cameras. If you need more than that, a wired system is required. However, if you have a normal or even large home and need two or three cameras, wireless might be the solution. Wireless means a quick set up and everything runs to your home router. If you are worried about hackers then wired might be better. Hackers can easily hack a wireless signal and disable or damage your cameras. But most households don’t have this problem. Really, wireless is a good solution to the modern family household. But for larger areas or higher risk areas, wired is a more solid solution. Most people find that they want one near their door. This way, you can see who comes and goes from your house even when you aren’t there. And criminals are most likely to test a door first, so this is the perfect time to spot them. Other people also like to monitor their driveway, or entire garden. But it really depends on what you want to use the camera for. For common criminal deterrent and security, your door and driveway might be good options. But if you have people trespassing, a good camera up high might serve your needs better. Many people worry that they will need to instal a security light along with their camera. 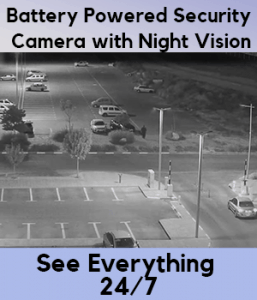 Most modern outdoor security cameras come with night vision that will let you record during the night without alerting others that you can see that area. Some night vision will actually not work as well if there are outdoor lights shining on the camera, so be sure to check your camera’s settings. Some people though might want to light their home and property anyways, in which case it might not be necessary to get a night vision camera. Outdoor security cameras come with features that specialise them to outdoor environments. These features include waterproofing and long distance HD vision. These specially suit outdoors, and make these cameras better than indoor cameras and other systems used outdoors. These cameras will also help to secure your home and property and are definitely worth it as a security asset. So how do we get wireless security cameras? They don’t run on magic, so what do they run on? Thanks to most households now having wifi routers, wireless security cameras use the wifi network to broadcast their footage to the cloud. From there, you can watch it live or later from your smart device connected to the internet. But what about wireless when it comes to power? Most wireless security cameras use either batteries, or in the case of outdoor systems, solar power. This means that there is no need for cables to run power to the cameras. No more holes in walls or chords draped across your home! All you need is a battery charger and a wifi router and boom! The whole system is running. And thanks to their waterproof design they will even attach to a tree or posts outdoors! So even your garden or porch can be monitored wirelessly. The Lynx Solar Camera is the top of the range when it comes to solar panelled surveillance cameras. One day of sun will power the battery for the next seven! So even areas with inconsistent sunlight, the solar panel Lynx system is a good choice. That’s right, no cables at all needed! Your personal wifi router will work just fine to forward all footage to the cloud where you can watch it remotely. The solar panels not only are beautifully mounted and designed, but they make your house look even more high tech! Both the panels and camera are small and will fit onto most walls and roofs. It also is best used with a smartphone, where you can download the live view application. The Foscam E1 is a great system that requires no wires to operate. The camera is run off a long lasting battery that can be easily recharged, and all signal goes through the wireless base station and wifi router. This allows this device to be placed anywhere on your property! These small Foxcam E1s fit discreetly onto almost any surface, indoor or outdoor. They are rounded and don’t draw undue attention like older surveillance cameras do. The Foxcam E1 can support up to 4 separate cameras on the same base station. So you will always be able to watch every corner of your property. And with motion and heat detector technology you will be alerted overtime a person or animal moves on camera. This makes it better than other cameras which do not use heat detection and pick up on all movement. Two way audio is also included to be able to hear and speak to people on camera. And all footage from the last seven days is recorded to the cloud free of charge. This camera system is great for anyone who wants to monitor their homes. Or their gardens! Because of the heat sensor and great waterproofing it could also be suitable for wildlife watching alerts. Or possibly those who have pets or children and want to keep an eye on them from work. All round a great product that can be changed for almost every kind of use.